Thing a WEEEEEAK » Blog Archive » OOOh Meta! 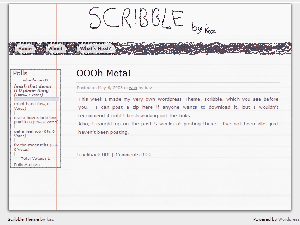 This week I made my very own WordPress Theme, scribble, which you see before you. Feel free to download it, but I wouldn’t recommend it until I finish working out the kinks. It isn’t even validating yet. Also, I caught up on the past 5 weeks of posting these. I’ve not been idle, just haven’t been posting.